A great article on addressing younger people requiring skilled nursing care, and the issue of younger adults living in nursing homes. This is an important topic for people with younger onset dementia, and worth reading. We will all need to work together to achieve a more age appropriate level of residential care, if it is every to happen across Australia and the world. 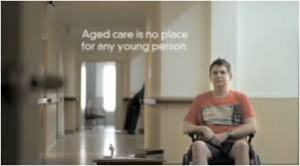 A support group for young people who live in nursing homes has called on the Federal Government to bring departments together to get young people out of the aged care sector.